Hello and welcome to Jammy’s Jaunts! Your weekly clubbing review of London! This jaunt covered the very special Bank Holiday weekend special featuring the Plex Basement Sessions 2, The Save You x Cartulis Day party, Superfreq, Richie Hawtin’s popup ‘secret’ daytime party, VOID and Enter London. So to start off the special extended weekender, I began in Stoke Newington on Friday for the next instalment of Plex’s basement party. 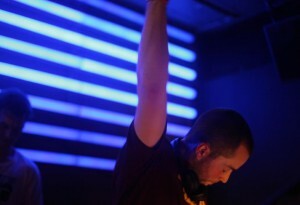 Their headliners were Orphx (Live A/V set) and AnD, alongside NCW, James Tec, Luke Handsfree and Skunkrock. 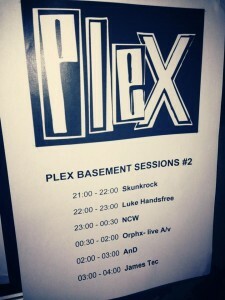 Set times were Skunkrock 21:00-22:00, Luke Handsfree 22:00-23:00, NCW 23:00-00:30, Orphx (Live AV set) 00:30-02:00, AnD 02:00-03:00, James Tec 03:00-04:00. So I arrived around midnight to hear NCW play and in my opinion I wasn’t too keen on the sound and this didn’t suit my musical taste. 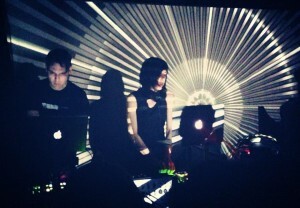 All I was waiting for, was Orphx to come on and AnD later on. Originally from Canada, Richard Oddie and Christina Sealey make up Orphx. Their sound is heavily based on modular and analog synthesisers, feedback systems as well other pieces of software and is very much on the darker side of techno combined with the early sound of industrial music. Their sound was very original and have played widely across Europe and I was really impressed by their set at Plex. Their A/V production alongside their set was pretty special and hypnotic and they both worked excellently together. In some places the music was slow and droney with great build up and drops and it was great to see them work with all that equipment in front of them. Their hour and a half set flew by and they did a really focussed job. Next up was AnD. Like Orphx, I have never seen AnD play before, so it was a great pleasure to see this duo play out. Originally from Manchester they played a really banging set and from the word go, there was no stopping them. Absolutely relentless and for an hour it was really powerful! It was a treat to see them playing and was I pleasantly surprised by their set. Definitely in the future, I would like to see them play again. By the time they finished playing, it was nearly time to go home. I caught a bit of James Tec’s set and by then it was time to go as lots of energy was needed for this extended jaunt! Next up in this bank holiday marathon was the Save You/Cartulis Day showcase at Basing House on Saturday. Headlining their party was Tom Clark (Highgrade/Panorama Bar/Cartuli’s) as well as DeadEcho (Save You) and Unai Trotti (Cartulis). I got there quite early, around midnight and it was cool to see Unai warming things up with his own flair of jacking house/tech house to get everyone in the groove. It was pretty cool stuff that was being played and he really pushed out the sound of Cartuli’s that has made them such an exciting party in London’s clubland. So around 1am the duo of Rob Bradley and Adam Firman (DeadEcho) came on and by then Basing House as comfortably full with a great crowd in. It was great to see such good friends doing what they do well and giving the crowd such great music to listen to. They had the place rocking with their tracks and everyone loved it. The groove, flow and excellent track selection made for an incredible set and it really showed as they were certainly having a great time behind the decks! A great start to a Saturday jaunt and it was nearly time to zip off to Paramount up Centre Point for the very special Superfreq party. This was the second time at Paramount after the Ardor party there and it was great to finally check Paramount out again. Headlining this party was Maayan Nidam alongside head honcho Mr C and Luke vB and last minute special guest Raymundo Rodriguez. 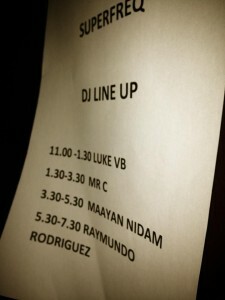 Set times: Luke vB 23:00 – 01:30, Mr C 01:30 – 03:30, Maayan Nidam 03:30 – 05:30, Raymundo Rodriguez. I arrived halfway through Mr C’s set and by the then the crowd were really up for it. I think this was my first Superfreq. It’s been a long while since I’ve been to this party or even heard Mr C play. Anyway back to the action, Mr C was dropping some great tracks and was really showing how it’s done especially as this was his ‘Smell The Coffee’ album tour. His sound was good and back in the day he was one of the very first DJs’ I saw play back at The End. The Superfreq crowd were out in force and it was really nice to catch up with familiar faces there. Maayan Nidam was up next and I caught her the other week at Fuse. Originally from Israel, she really worked the crowd up with her own style of really decent tech house and it was effortlessly groovy and perfect for the Superfreq masses. I never really caught much of her at Fuse and it was great to see her play a wicked set at Superfreq. Definitely one to check out if you like your groovy bassline tech house. Last up was Jaded resident and soldier Raymundo Rodriguez. He came on to a great ovation for Maayan Nidam and it was great to see Ray on the decks once more. As the sun came up and the amazing views of London came into view he took things up to a different level and the whole night was very enjoyable. He completely smashed it and it was a perfect ending for a great Superfreq night especially when he dropped his Carbon Power House Re – Edit’. That seriously topped things off for a great Superfreq party! What a great Saturday jaunt! 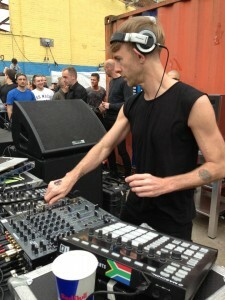 Next up on Sunday daytime was the very special Richie Hawtin pop up 2hr set in East London (Dalston). Massive hype via the online social mediums of where this ‘secret’ was and in the end it actually was a decent outdoor space. It started at 4pm on the Sunday until 6pm and fingers crossed it didn’t rain as there was no canopy or covering whatsoever. I got there early and it was good to feel the vibe and check out the crowd and any familiar faces in the crowd. It was also quite handy being near the front too which was good, especially for the photo opportunity! From start to finish it was hard jacking tech house and it was quality the whole way through. I don’t think I could have faulted it, it was that good, 2hrs, free in London. Perfect. By 4pm the place was absolutely rammed from front to back and it was difficult to move at the beginning. However as time went on, there was space and eventually we found ourselves moving further and further back. Hawtin kept things rolling and 2 hours flew by. The place was surrounded my containers with people attempting to climb on top of them to get a closer look and some were even trying to scale the high rise fencing! Some got in, but it was funny to see the ones get so close to the top of the fence and then fail! A very cool lil warmup jaunt to the evening’s proceedings and it was a nice lil starter to VOID at 1001 which was next. Popping quickly down to Shoreditch, the next jaunt was at 1001 for Void. The next instalment of their monthly party at 1001. I arrived at around 7pm and good pal Jay Clarke was on and by then 1001 was pretty much full. It was nice to catch up and see all the VOID regulars having a great time. Jay as usual was doing his very best, smashing out the Funktion 1 soundsystem and it was good to catch the last half hour from him. From 7:30pm – 21:00 were Kontrol Room headed up by Chris Page and fellow partner in crime Dave Johnys. It was great seeing them play again and they certainly took things up a notch as they came on! The techno by then was relentless and the vibe was certainly evident. The presence of the strobe wasn’t available unfortunately this time around which was probably a good thing as it was maxed out at the last Void, so large parts of 1001 were quite dark, just the right mood and atmosphere for techno! Last but by no means least, Void’s headliner: Billy Allen. He came on at 21:00 and closed Void to an incredible reception. Highly sought after in London’s techno landscape and extremely talented, he took things to another level. His range of techno was incredible and easily the set of Void for me. He is head of record label: Candela Rising and recently lots of great releases have come from here, especially the Coal Bath EP by Lakker. Definitely worth a listen and get it while you can! I think this was the best I have heard him play and he certainly looked like he enjoyed it! What a great Void adventure.